THIS IS PRE-ORDER ONLY AND ETA IS MID-JUNE. NOT IN STOCK AND THESE ARE STOCK PHOTOS AND NOT OF ACTUAL GUITAR. Combining exotic tonewoods with premium pickups and appointments, the limited-edition Rarities Collection creates a truly unique musical experience. 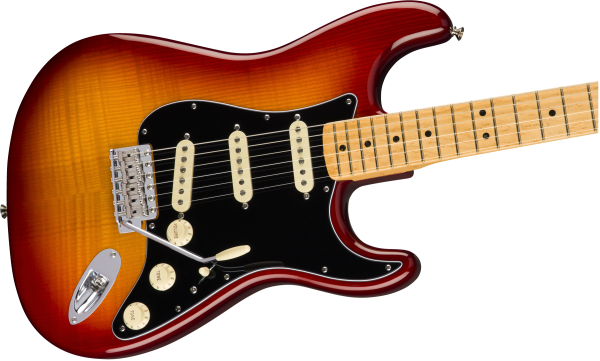 The Rarities Flame Ash Top Stratocaster features a two-piece alder body with a Plasma Red Burst flame ash top and a one-piece birdseye maple neck. The Custom Shop 54 single-coil pickups add a classic note to the traditional Strat® voice. The “60s C”-shaped birdseye maple neck provides a warm, clear sound, while the 9.5”-radius fingerboard and narrow-tall frets make bending easy. Other features include black pearloid inlays, vintage-style tuning machines and six-point synchronized tremolo, and a lacquer finish that lets the wood “breathe” naturally with resonant tone. Includes a vintage-style brown hardshell case.